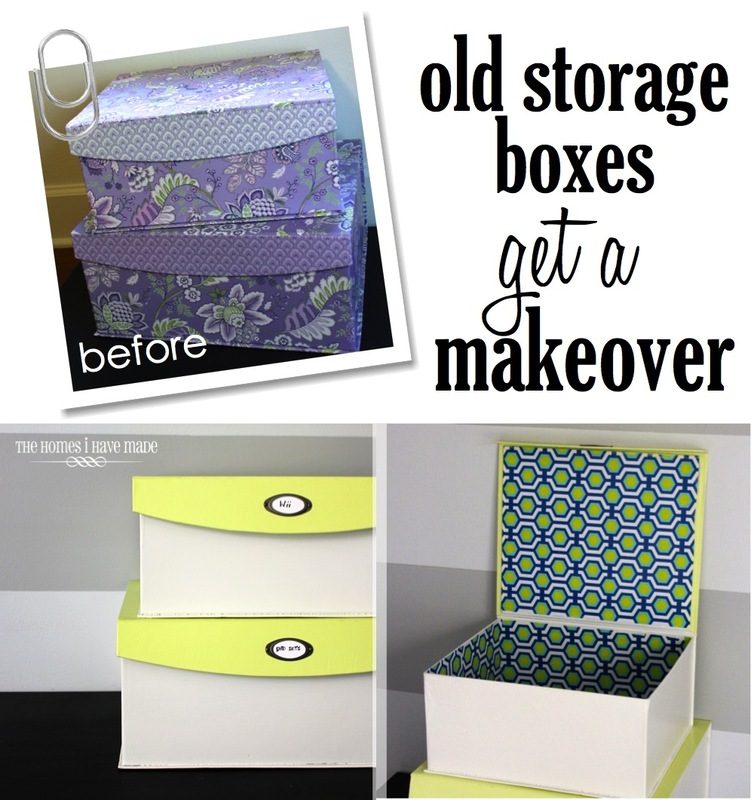 Old Storage Boxes Get a Makeover! 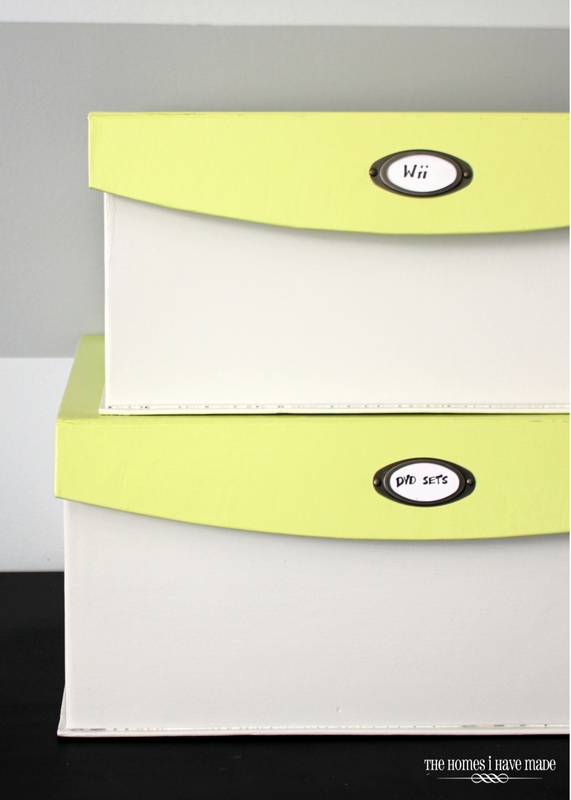 As I mentioned last week, I’ve found some time in my “project schedule” lately to finally turn toward some smaller DIY/organizational projects that have long been on the To-Do List, but have been bumped and bumped due to bigger, more time-consuming endeavors. One of these smaller projects has been to tackle our media situation under our Media Cabinet. 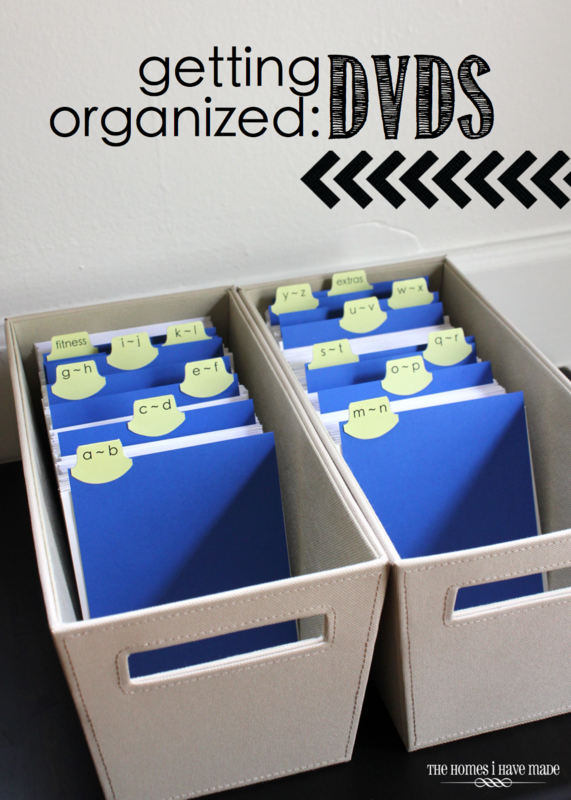 I showed you how I organized our DVDs into alphabetical categories in totes, and promised I had another project up my sleeve to organize our larger DVD sets and gaming accessories. I’m popping in today to show you just what I did! Both because of budget and clutter, I have really taken to “shopping my home” lately. Over the past year, I’ve found myself running out to the store for new accessories/supplies for some project and then turning around and donating something similar out of our “stash” because I can’t handle the clutter. As such, I’ve been trying to analyze every item in our attic, storage and craft room to see what I can up-cycle rather than run right out to the store. More often than not, I’m pretty successful. This makes me crazy excited because it’s a win, win, win: I don’t spend any money, I get something OUT of our storage and into use, AND I get a project to work on. Just a few hours and some supplies from around the house, and these boxes went from trash to treasure. The outsides might be a tad boring, but WOWZA, look at the inside! 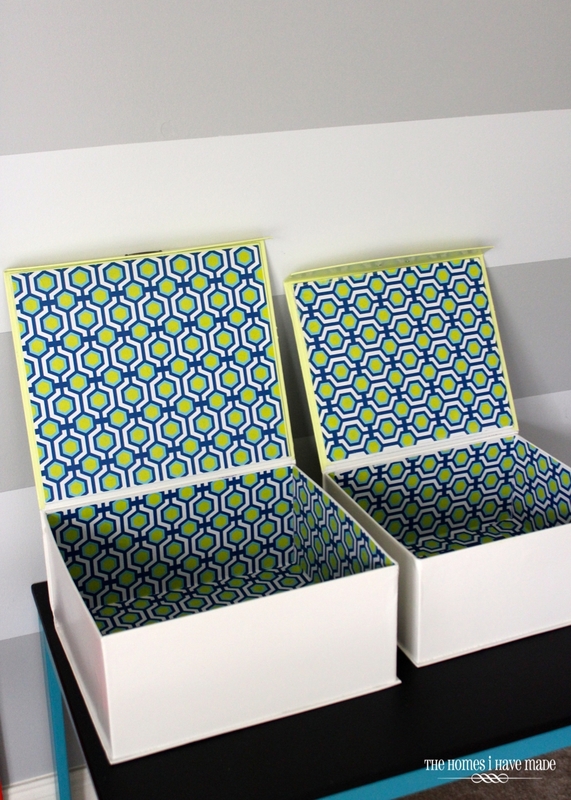 These boxes are the run-of-the-mill cardboard/paper boxes you can find in endless shapes, sizes, and patterns at stores like Michaels and Marshalls. 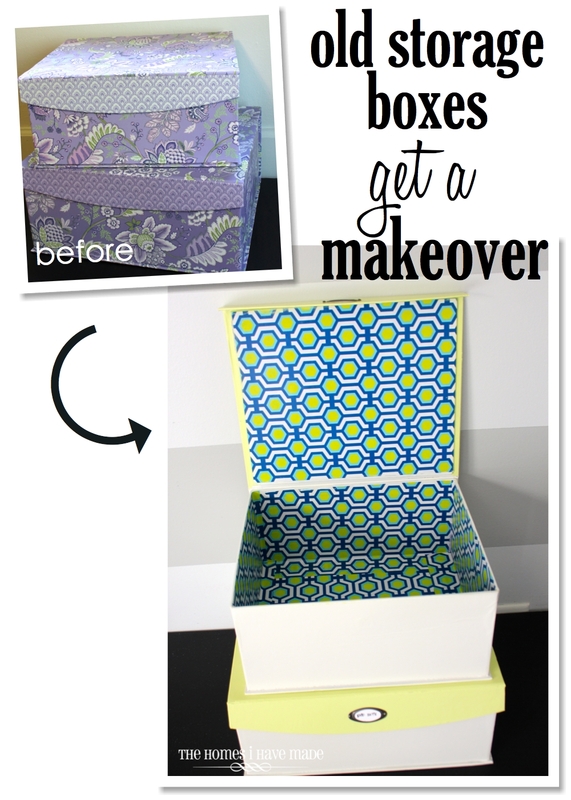 I had success painting similar boxes in the past, so I knew some paint would be my easiest and fastest way to change their look! Once the outsides were fully dry, I went to work on the insides! 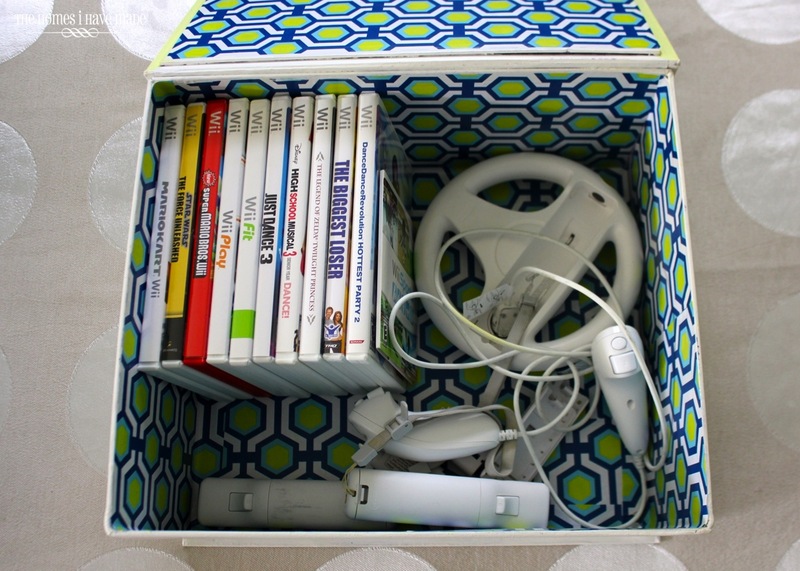 The smaller of the two was loaded up with our Wii games and accessories. 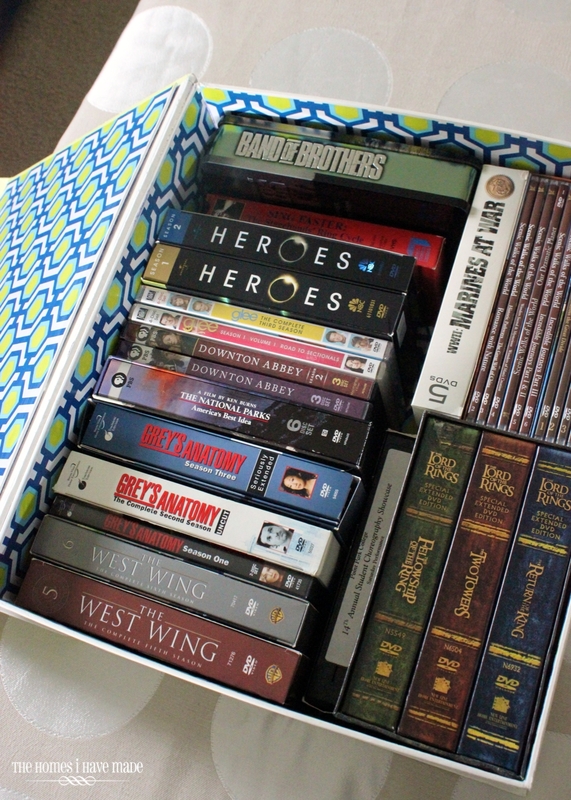 The larger box holds all of our DVD sets perfectly. I usually ensure I have room to grow in our storage solutions, and as you can see here, there is no room to grow in this box. We actually don’t buy many DVD sets anymore since 1) they are way too expensive, and 2) almost anything is available online these days. This box holds what we own and will (hopefully!) deter us from buying anything we don’t need! 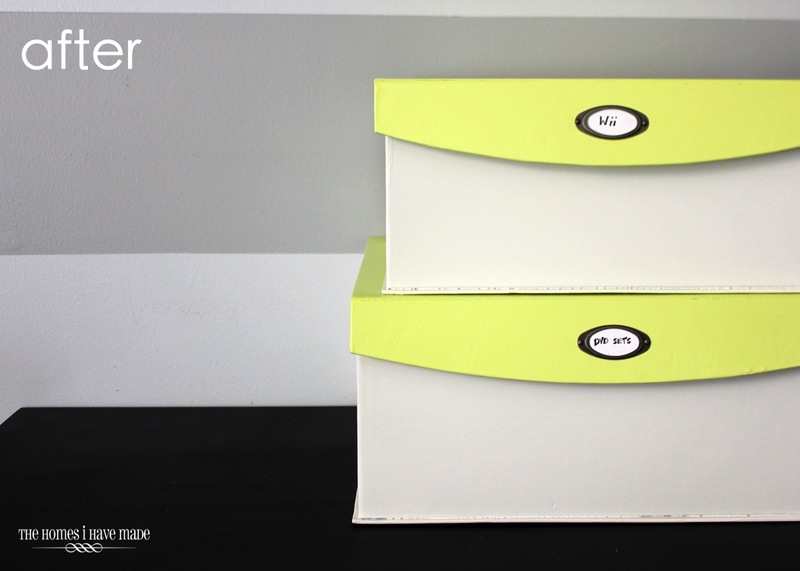 The two boxes slide in oh-so-perfectly under our Media Cabinet for easy access! 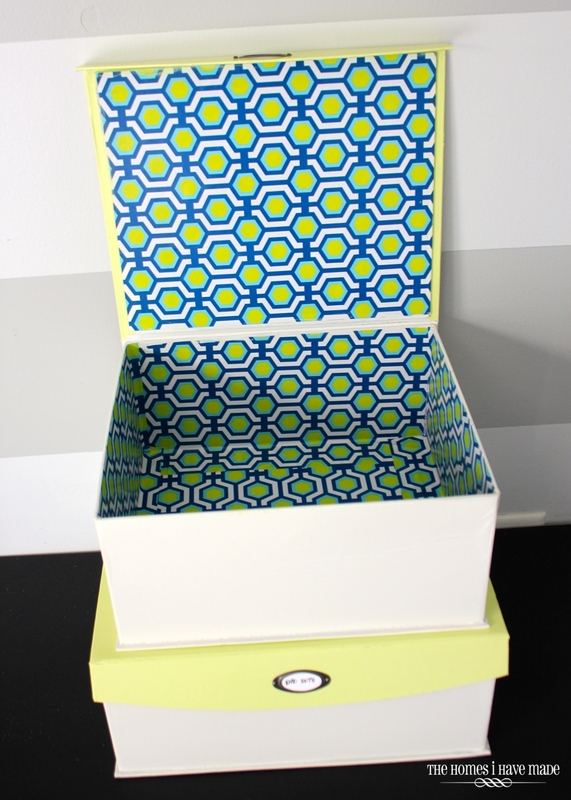 Oh – and I mentioned that I have painted and papered boxes before. 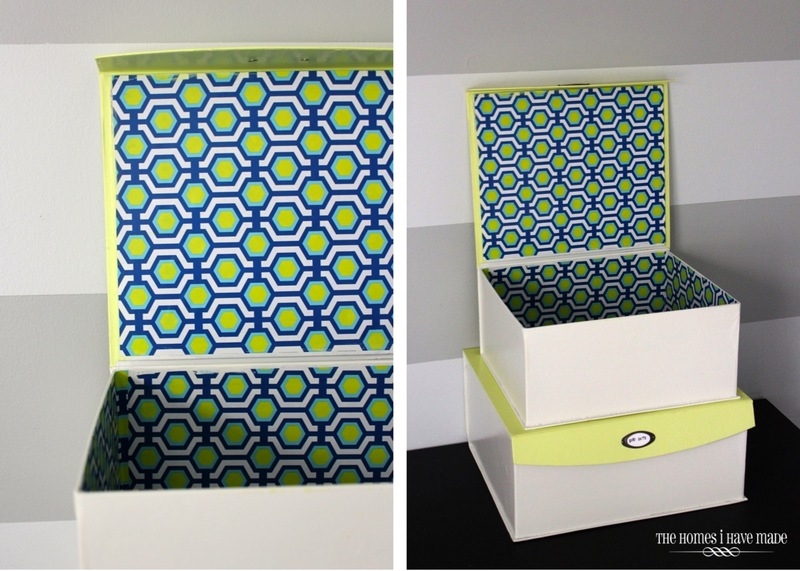 Here’s another example of how tI did a similar makeover for our Laundry Room. 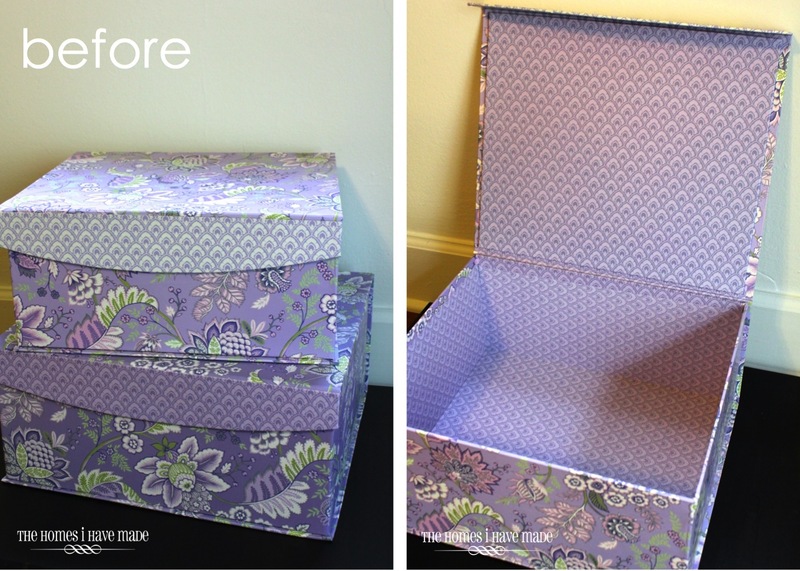 This project was such a fun way to fill a weekend, solve a storage problem, AND get something out of our attic. I hope I’ve inspired you to look at the items in your home with some new eyes! 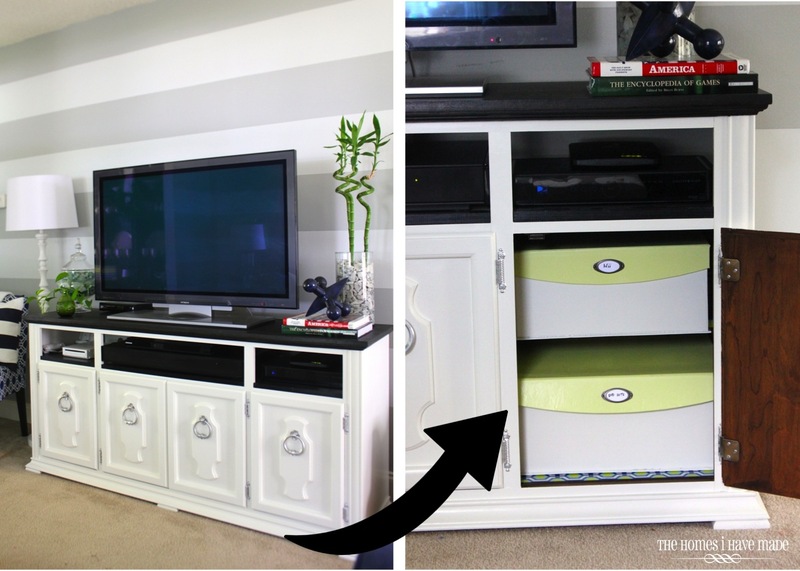 Next week, I’ll give you a final glimpse on how our media cabinet storage has turned out. This weekend, I’ve been struck with some major inspiration for our home office, so I am back to working hard in there! Hopefully I’ll have an update for you soon! Have a good weekend! These look great. What a cute makeover ! 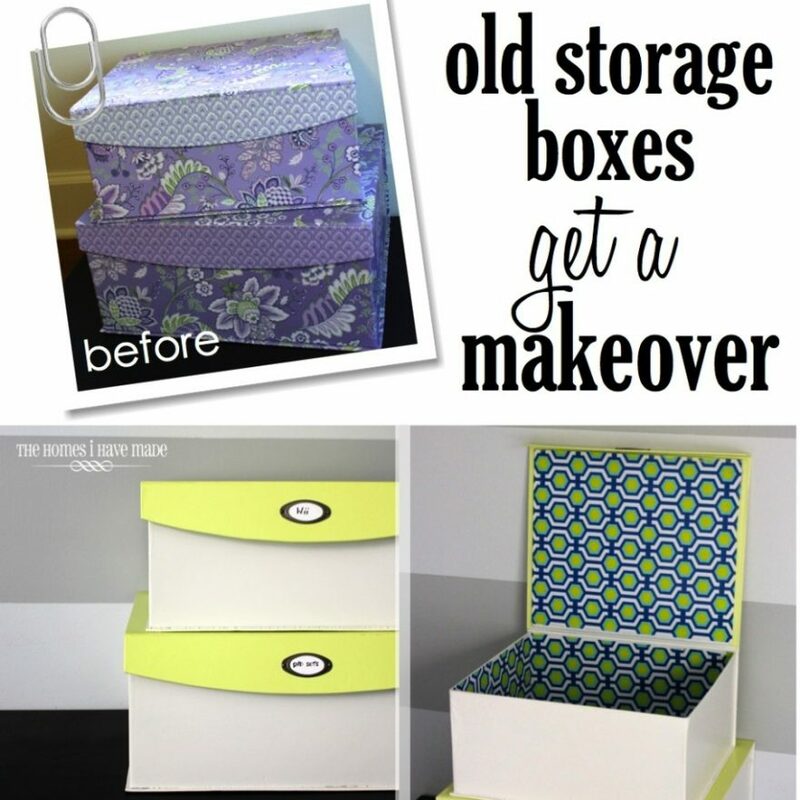 This is really a nice job you have done for these old storage boxes.I also have some boxes so I am thinking to get them decorated like you. Love the boxes!! They are so colorful and fun!! Great idea!! 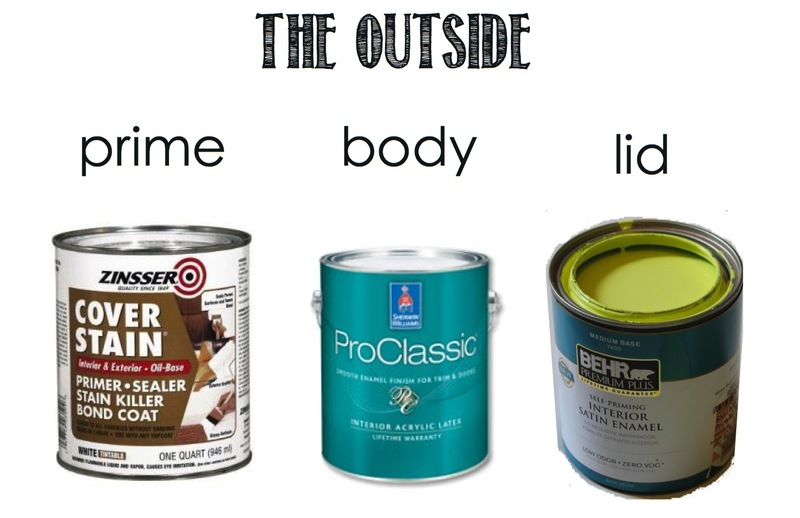 You did such a fantastic job refurbishing those boxes, they look like new kids on the block. Makes us wonder why we buy things we do then not use them. I always think it's cause we'll need them for something else later on and will be handy. Don' t know how many times I've done that especially with fabric. This is a great tutorial! 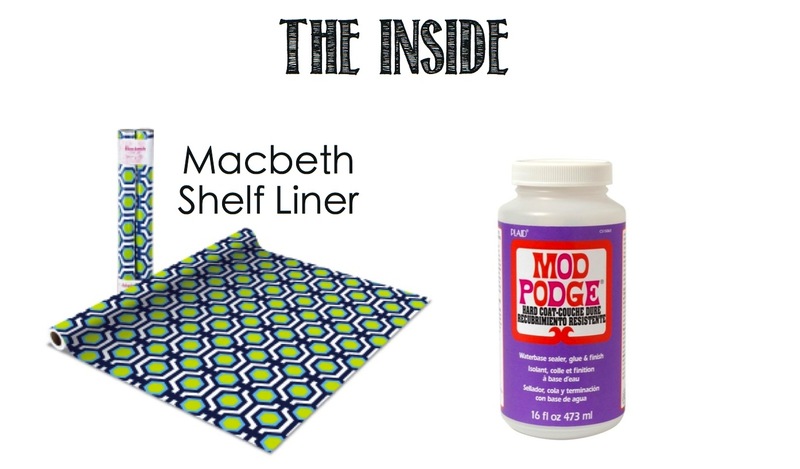 I never would have thought to use the mod podge over the paint and shelf liner. Such a smart idea!! I'm moving next week and have some plans to redo my office — and just like you I don't want to throw out all my organizational items. 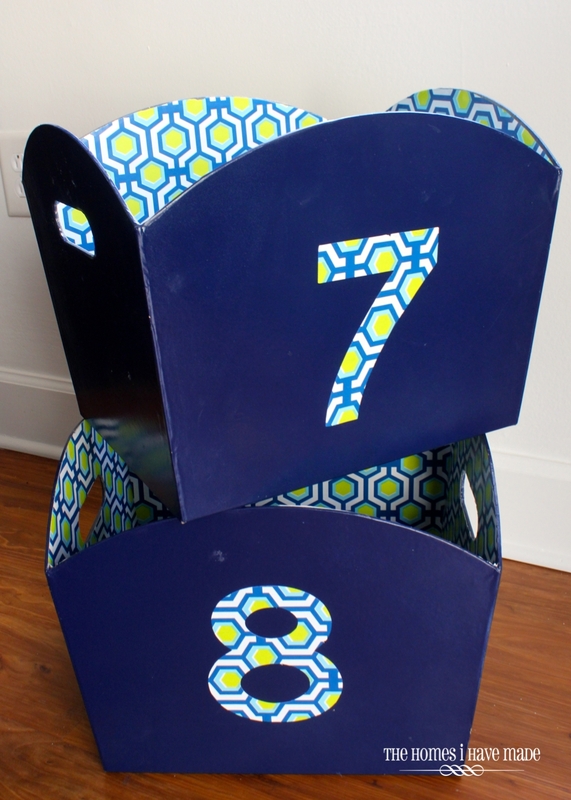 I'll definitely be using some of these tricks to make them coordinate! Found you via iheartorganizing!